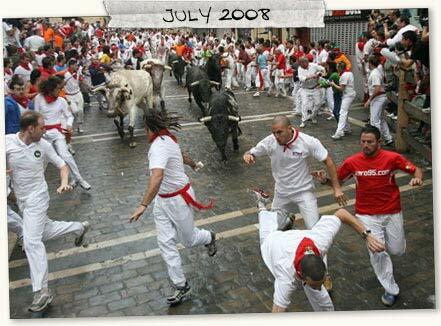 We live in Florida, USA, and we have been attending the San Fermines fiestas in Pamplona for over thirty years. We have many friends and family in the old city, where the Running of the Bulls fiesta takes place, and we visit these very dear friends, and family! - every July. This website and Maria connect you to our friends in Pamplona. Over the years, we have assisted tourists from the United States, Canada, all over Europe, Asia, South America, Australia and New Zealand in obtaining great balcony reservations, for watching the bullruns; bullfight tickets; and great rooms and apartments for their lodging during the festival dates. When you call the 800 number (USA 1-800-343-5844), the phone rings at our Mountcastle International business. (www.mountcastle.com) in St. Pete Beach, Florida. (We are on Eastern Time, USA.) We have been in business for over 25 years helping local artists in over 30 countries market their folk art to Western markets. When you call us at this number, our manager will put you in touch with María as soon as possible. Or, the fastest way to reach María is via email at maria@bullbalcony.com. We have an office in Pamplona on the very centrally located Calle Santo Andía in the old city where all bullfight tickets and keys for your rooms and apartments can be obtained once you arrive in town. You will also be provided with our local phone number in Pamplona to call with any questions. We look forward to hearing from you, answering your questions and seeing you in Pamplona for the Running of the Bulls - 2019! We accept payments through Visa, MasterCard and PayPal. We can also accept a direct bank transfer or a personal check, if drawn on a USA bank, in the current bank rate for the euro.